← Пасха. Пасхальные обычаи! Russian Easter & Customs! Over the last year I have been leading a double life. There was me – a “celebrity” pianist hopping from a concert to a concert, all over the world; learning new pieces, meeting fans, recording, chirping about my happiness in upbeat interviews. The worst thing that can happen to any country is fratricide war, people seeing each other, their neighbors as enemies to be eliminated. This is what has befallen my beautiful Ukraine. My heart was bleeding. You all saw on TV screens all over the world a magnificent revolution, the people of Ukraine raising in fury against their corrupt rulers, for a better life. I was so proud of my people! But the ruling class doesn’t let go easily. They managed to cunningly channel away the anger, to direct it to other, often imaginable, enemies – and worse, to turn people upon themselves. Year later, we have the same rich people remaining in power, misery and poverty everywhere, dozens of thousands killed, over a million of refugees. So, I took to Twitter ( how many of you know I have a Twitter account? LOL) under a name “NedoUkraïnka” – a word roughly meaning “Sub-Ukrainian”, a stab at Ukrainian Prime Minister who called Russian-speaking Southern and Eastern Ukrainians “SUBHUMANS”! Yes, I kid you not. In an official written document. I am a subhuman, my husband, my mom….I mastered Ukrainian language perfectly, far better than a so-called “president” of Ukraine. But I don’t speak it to my family, I didn’t sing lullabies to my son in Ukrainian, when I sleep I never see the dreams in Ukrainian, when I will be dying my last words will NOT be in Ukrainian…. Sorry, I got carried away telling you those things… To get back to my story – I took to Twitter in order to get the other side of the story heard, the one you never see in the mainstream media – the plight of my people, the good and bad things that were happening in Ukraine. I translated news stories from Ukrainian language websites, I translated eyewitness accounts of atrocities…. I became really good in unmasking fakes published by Western media in order to make one side of the civil war look whiter and softer than Easter bunny, and another – as sub-humans, not worthy of mercy, the “collateral damage. I was very proud! But with time my activities attracted a lot of vicious haters. I was a particularly important “target” because of being Ukrainian, thus – a traitor. I thought I knew hate – my playing on YouTube certainly “attracted” a fair share of hate mail. But I was mistaken. Death threats, wishes for my family to die, calling me “paid Kremlin wh*re”…the list goes on and on. I am scheduled to play Rachmaninoff Concerto #2 with Toronto Symphony Orchestra this week. Back in December someone in the orchestra top management, likely after the pressure from a small but aggressive lobby claiming to represent Ukrainian community, has made a decision that I should not be allowed to play. I don’t even know who my accusers are, I am kept in the dark about it. I was accused of “inciting hatred” on Twitter. As the “proof” , ironically enough, they presented to the orchestra my tweets containing, of all things, Charlie Hebdo caricatures depicting lying media!!! We all know what those who can’t tolerate free speech did to Charlie Hebdo journalists. Now, the orchestra based in one of the freest democratic countries is bending over to the same kind of people, helping them to assassinate me – not as a living person yet , but as a MUSICIAN for sure. Yes, they will pay my fee but they are going to announce that I will be unable to play and they already found a substitute. And they even threatened me against saying anything about the cause of the cancellation. Seriously. And I thought things like this only happen in Turkey to Fazil Say? Before you decide to help me – If you wish, please take time and read my tweets. You might find some of them offensive – perhaps. The satire and hyperbole are the best literature tools to combat the lies. Bear that in mind when reading. 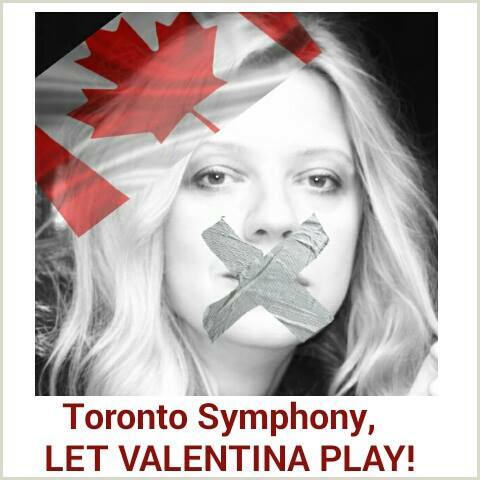 I ask you to raise your voice and tell Toronto Symphony that music can’t be silenced. Ask them to let me play. If you want to write something – great! Ask your friends to join in.